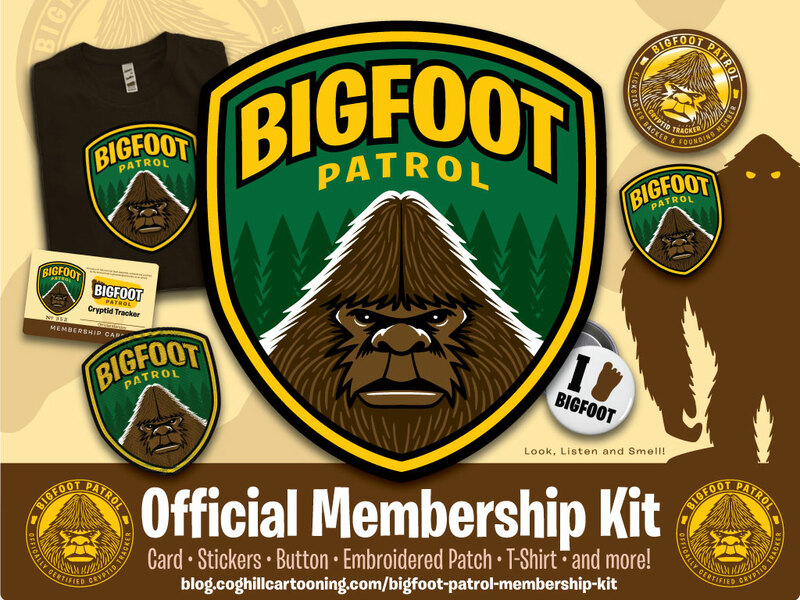 The Bigfoot Patrol Membership Kit fundraiser campaign starts on Kickstarter on Friday, August 8, 2014 and runs for 30 days until Sunday, September 7, 2014. 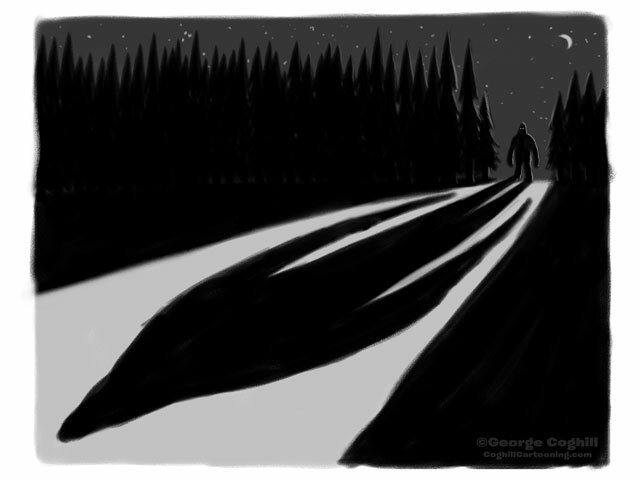 The Bigfoot Patrol Membership Kit is an art project created, developed, illustrated and designed by artist and cartoonist George Coghill (that’s me!) and it will be my first large-scale merchandising push for my cartoon art. The “Bigfoot Patrol Membership Kit” started as just one of the Daily Sketches I’ve been creating in 2014 as a way to make sure I work on personal art every day, share art online every day, and draw just for my own enjoyment. It has been a hugely beneficial discipline on many different levels. Along the way I’ve created artwork that arose out of the momentum of previous Daily Sketches leading up to the day. One of these sketches was inspired by a retro image of Smokey The Bear and a “Junior Ranger” embroidered patch I stumbled across online. At the time, I was drawing a long series of Bigfoot-themed sketches, and thought to myself “Bigfoot is the ultimate park-friendly camper — he never leaves a trace!” That, coupled with the retro Smokey The Bear merchandise, led me to sketch up a Park Ranger inspired patch design featuring Bigfoot. The name “Bigfoot Patrol” popped into mind. I thought little of it, aside from liking the fun concept and the sketch which came out nice. The response online was pretty overwhelming, with lots of positive feedback and plenty of “I want one of those patches!” or “Make this into a t-shirt!” comments. I realized I needed to do this, the design was just calling for it. 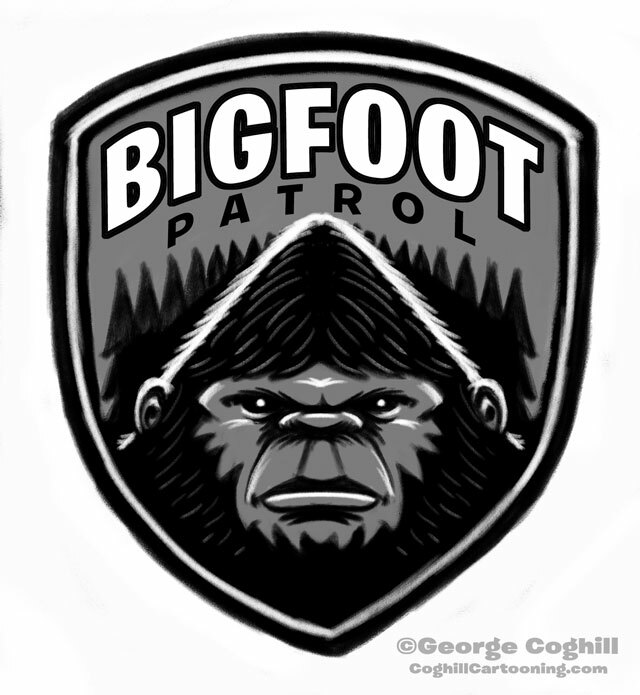 As I was finalizing the color art for the patch illustration and design, I started playing around with some ideas as if the Bigfoot Patrol was a real department in the National Park System. Soon, I had developed a brand identity package, some marketing materials, and other artwork that would come to be organized into an official membership card, echoing the Fan Clubs of the past. I wanted it to have a retro feel, but nothing too kitschy. I started to realize how much fun it would be if all of this stuff was an actual, tangible membership kit you could order. I knew I myself would want one of it existed. So I decided to make it happen. And as I dug deeper, I started thinking of more ideas, more products and more merchandise that just had to be included in any “official membership kit” — like buttons, stickers, and of course the membership card. And a t-shirt. There was actually a ton of other item ideas, but I had to draw the line to keep this fundraiser as low as I could. Of course, checking into prices and minimum quantities to produce these items quickly escalated the funds needed, and that is where this Kickstarter campaign comes in. The pricing is actually quite reasonable, and seems attainable enough for all the cool stuff you’ll be getting. the real bite out of the wallet is in the shipping, which surprised me. Yes, the reward levels are priced higher than the cost of the production of the items, but all the shipping is included as well as costs for packaging (which was higher than I had anticipated). I am also aiming to cover potential gaps in reward levels that may not be fully funded on their own. If we meet the goal and exceed the minimums, I will make sure everyone is duly pleased with some extras. Like I said, there were a lot of products I researched and priced, but left out of this campaign. I added in some top-level rewards featuring signed prints of one of the most popular Bigfoot sketches to date (the art, shown above, will be finalized for the official print), and even some limited reward spots with original art to help move this along. All the artwork has been created, designed and is ready to go to the various printers and manufacturers to get all of this cool stuff into production. The only thing we need to know is how much to order! That’s where your funding comes in. 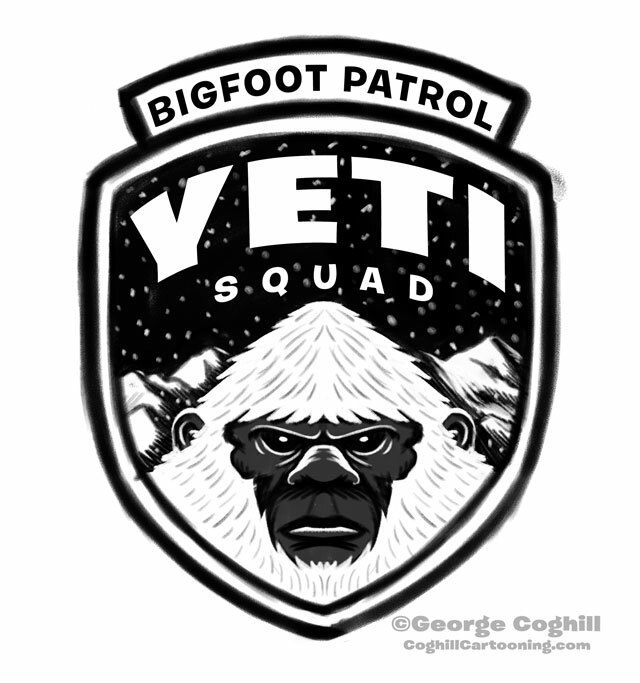 “Yeti Squad” one of 9 more “Bigfoot Patrol” patch designs that need to also be made into actual items. Let’s make that happen!